International Indian Film Academy, each year, since its inception back in the year 2000, celebrates Indian cinema with an idea to promote it beyond the shores of Indian subcontinent and to provide a platform to establish a direct connection between Indian film stars and numerous non-resident Indians living across the globe. In these 17 years, IIFA has been organised in London, Sun City, Malaysia, Johannesburg, Singapore, Amsterdam, Dubai, Yorkshire, Thailand, Macau, Colombo and Toronto. This year it is being held in New York City. Like always, the craze for Indian stars and Indian films among NRIs is breathtaking. They idolise Shah Rukh Khan with as much of fervour as they do Tom Cruise. More recently, the way Dangal paved its way to unfathomable global success is a result of that love and understanding for Indian cinema among non-Indians. IIFA is one such place that stands testimony to that stardom as well as fandom. It was the first ever chapter of the IIFA Awards which was held at the Millenium Dome in London. 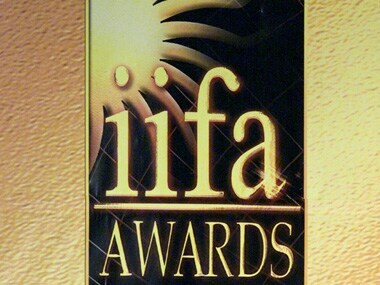 With Wizcraft handling the event, IIFA Awards 2000 was the most extravagant award function by Indian standards. 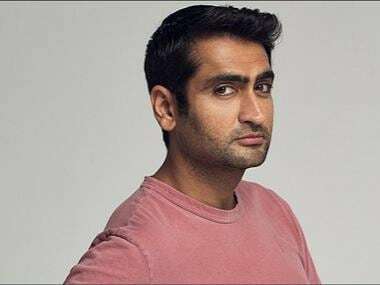 International movies’ big shots, from the likes of Angelina Jolie, Jackie Chan, Kylie Minogue, Finley Quaye, Miranda Richardson, Sussanah York, Talvin Singh and Ashok Amritraj, all attended the show. Chan was conferred with the IIFA Special Award for Global Impact. Speaking to the audience, he said, “I really want to make Indian films and I believe today there are a lot of directors and producers. 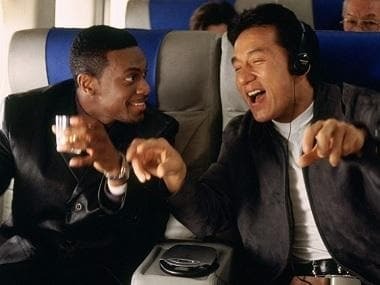 Invite me, I am not only good for comedy, action and stunts, I am a very good singer and I am not very expensive." 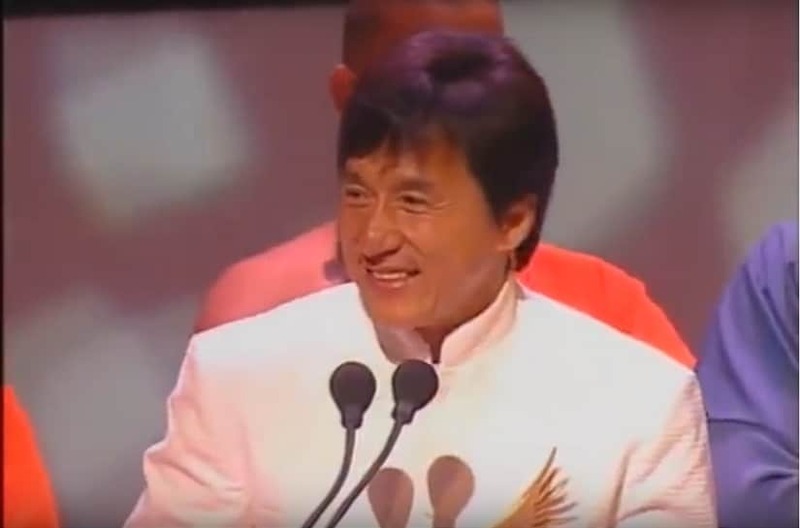 Jackie Chan at IIFA Awards 2000. Screengrab from YouTube. Anjelina Jolie and Shah Rukh Khan at IIFA Awards 2000. Screengrab from YouTube. Australian pop-star Kylie Minogue performed on her then recently launched album Light Years’ number ‘Spinning Around’ and made the audience go completely gaga over her gig. Kylie Minogue at IIFA Awards 2000. Screengrab from YouTube. This year saw the IIFA stage going magnetic with the presence of Hollywood action hero Jean-Claude Van Damme, who presented the Best Actor award to Amitabh Bachchan along with Bollywood superstar Salman Khan. During the presentation Van Damme candidly asked the audience whether he and Salman should do an action movie together and exclaimed (along with the audience), "Yeah!" Salman also smirked and replied saying, "I'll do all the romance and he does action." 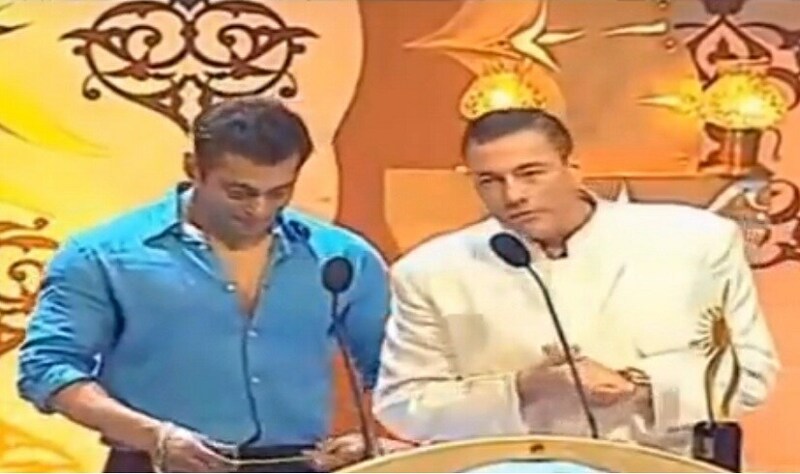 Jean Claude Van Damme with Salman Khan at IIFA Awards 2006. Screengrab from YouTube. British actor and Academy Award winner Colin Firth present the Best Actress award along with Preity Zinta. The winner was Rani Mukherji, however Karan Johar took the award on her behalf as she couldn't make it to the event. 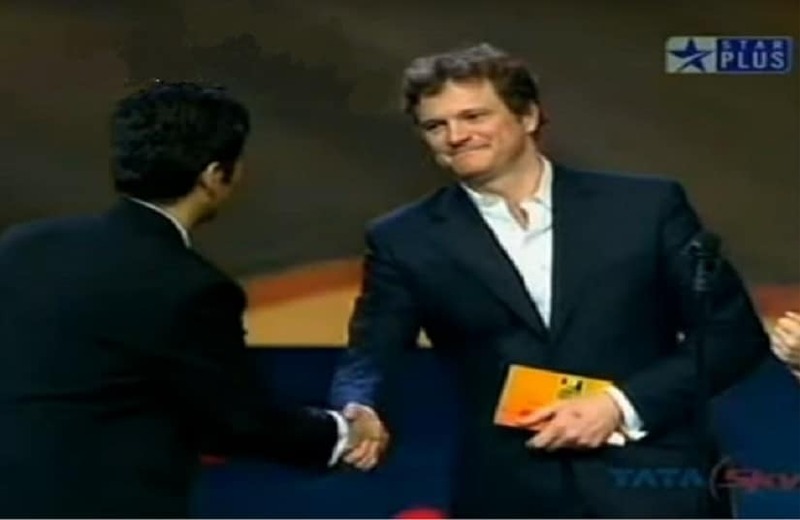 Colin Firth at IIFA awards 2007. Screengrab from YouTube. In its 11th year, IIFA Awards saw Hollywood actress and Academy Award winner Hillary Swank grace the event with her presence. She was accompanied by Anil Kapoor at the 'green' carpet (IIFA's environment-friendly take on red carpet). She also went on the stage along with Kapoor to present the Best Actor Award to Shah Rukh Khan. Hillary Swank along with Anil Kapoor at IIFA Awards 2011. Screengrab from YouTube. 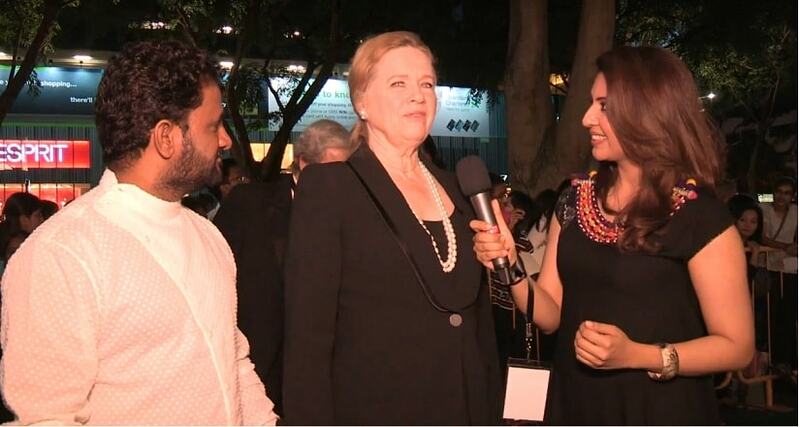 Norwegian actress and screen legend Liv Ullmann, who is famously known for her roles in Swedish cinema-maestro Ingmar Bergman's films, made an appearance at the IIFA Awards in 2012 along with Academy Award winning sound recordist Resul Pookutty. Speaking to IIFA correspondent, Ullmann said, "I really think you [Indian cinema] has something new to offer, which goes along with joy, understanding, but also caring...caring that goes for other side of the cinema - recognising people." Liv Ullmann along with Resul Pookutty at IIFA Awards 2012. Screengrab from YouTube. In 2014, IIFA Awards ceremony experienced double bonanza with Hollywood aces Kevin Spacey and John Travolta not just appearing at the awards but also dancing to the tunes of Bollywood numbers. Travolta grooved along with Priyanka Chopra and Hrithik Roshan on two separate occasion during the event. On the other hand, Spacey tied the Indian lungi along with Deepika Padukone and the hosts for the evening - Shahid Kapoor and Farhan Akhtar and danced to Padukone's song 'Lungi Dance'. John Travolta and Priyanka Chopra at IIFA Awards 2014. Screengrab from YouTube. With such international presence at IIFA Awards over these years and with the fact that Indian films are penetrating the international movie market like never before and Indian movie stars featuring in big Hollywood projects and to top that, winning awards in the foreign territory, it goes without saying that "ye waqt hamara hai" (This time is ours).